Erica Bunker | DIY Style! 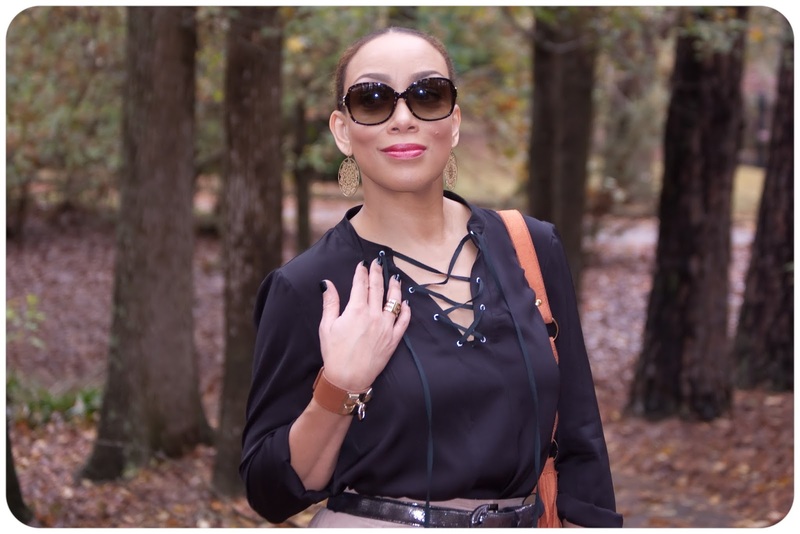 The Art of Cultivating a Stylish Wardrobe: 70s-Inspired Fall Fashion Style -- How I Make it Work for Me! 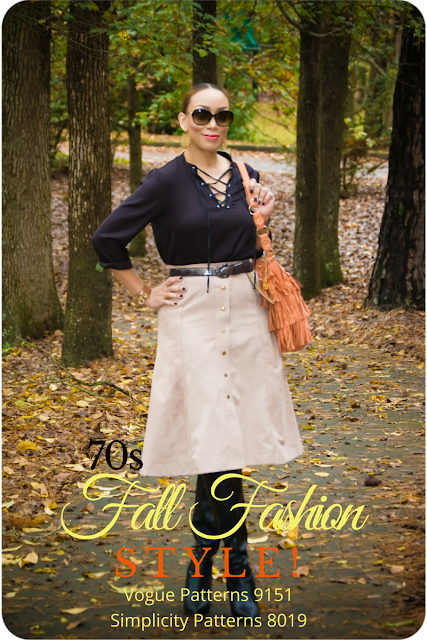 70s-Inspired Fall Fashion Style -- How I Make it Work for Me! It's no secret that I have a major affinity for styles from the 70s. As I've said before, that's my decade! And I love taking inspiration from that time period which is so hot right now, and making it work for this fall. My goal is to take my 70s Throw-back trends and work them into my wardrobe without looking kitschy or as if I'm in costume. And when this period in fashion has moved on, I'll still have great, well-made and wearable pieces in my closet. For my look, my top is Vogue 9151, view C in this amazing Theory Black Stretch Silk Georgette. I promise I'll be ordering more of this. I cut the size medium, 12 -14. It was perfect straight out of the envelope. This is a "Very Easy" pattern and I treated it as such. Where I would usually do French seams, I just serged all of mine. This fabric has 7% spandex, so I treated it just like I would a knit. It has just that much "give". The details of this tunic are quick and great. I love the yoke in the back with the pleats. Being inspired by the 70s, I decided that the neckline was a little too plain for me and I gave it a little 70s zhooshing by adding Dritz Eyelets and lacing. I sewed this using a Schmetz 80/12 Microtex needle. 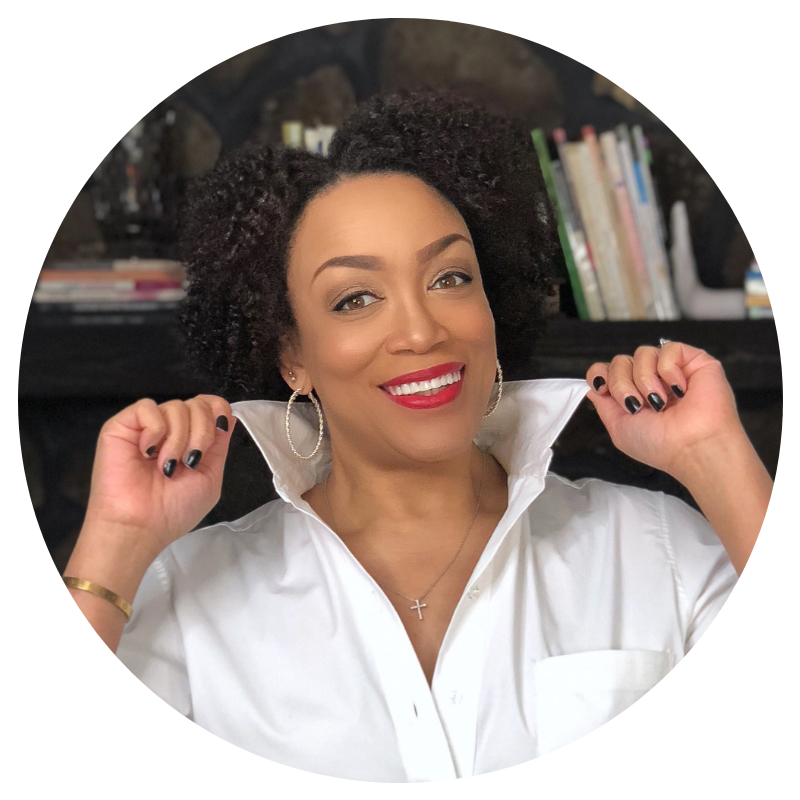 I love this tunic and it's going to be one of those go-to items I'm going to be reaching for months to come. The time of this skirt pattern was perfection! It's new release Simplicity 8019. 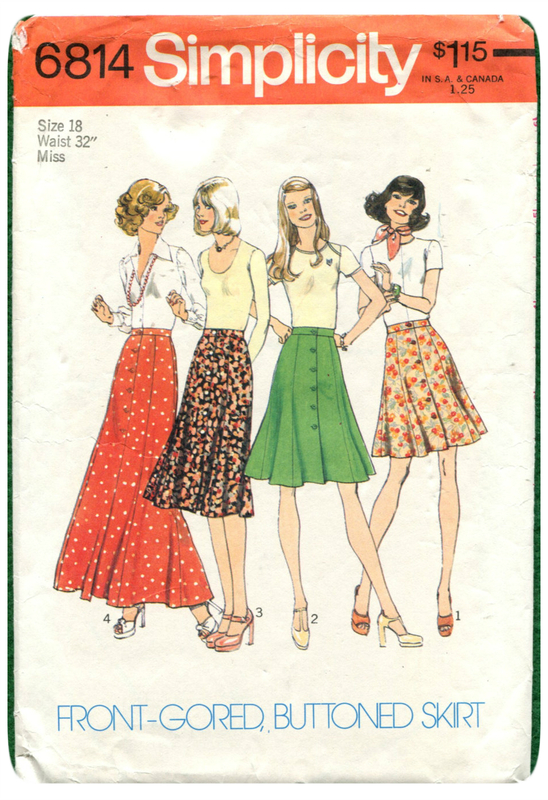 This pattern is a re-release of Vintage Simplicity 6814 from 1975. I cut my skirt, view C in a size 14. It's high-waist and slim fitting through the hips. Don't let the pictures fool you: it's not a-line, it's a flared skirt. So I would base the size of this skirt on whatever you would cut for a fitted pencil skirt that doesn't have stretch. 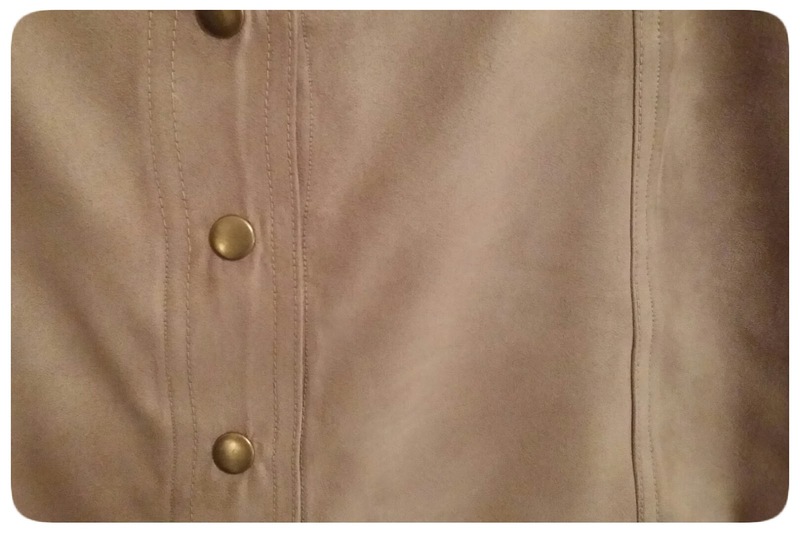 My fabric is Khaki Micro Suede from Hancock Fabrics. I edgestitched and topstitched as if this fabric was genuine suede. I sewed this using a Schmetz size 80/12 needle. I topstitched with Coats & Clark Heavy Duty thread using a Schmetz 90/14 topstitch needle. And instead of buttons, I used Dritz Heavy Duty Brass Snaps. 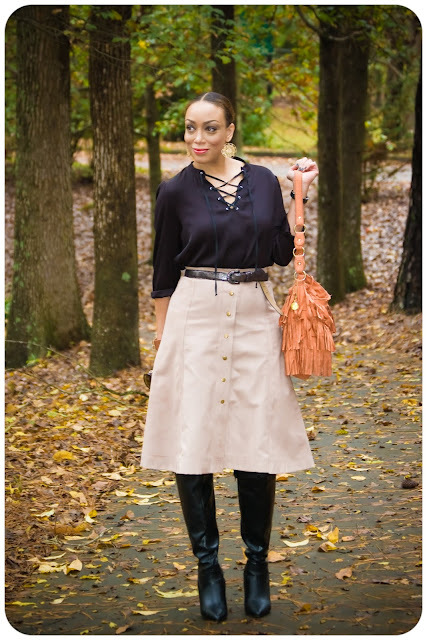 Styling tip: To complete my look, I belted my skirt, added a fringe bag and over-the-knee boots. Love the entire outfit. The details you add to the tunic definitely gave it that '70s touch and adding snaps instead of buttons was a great idea. Love it! You are rocking this 70's ensemble! I love the lacing detail you added to the top as well as the snaps on the skirt. You always come with it......love your attention to details! I just love that blouse! The eyelets were an excellent idea. Great inspiration for me. I'm currently feeling the 70s too. But, think I'm too short and thick of leg to get away with it. 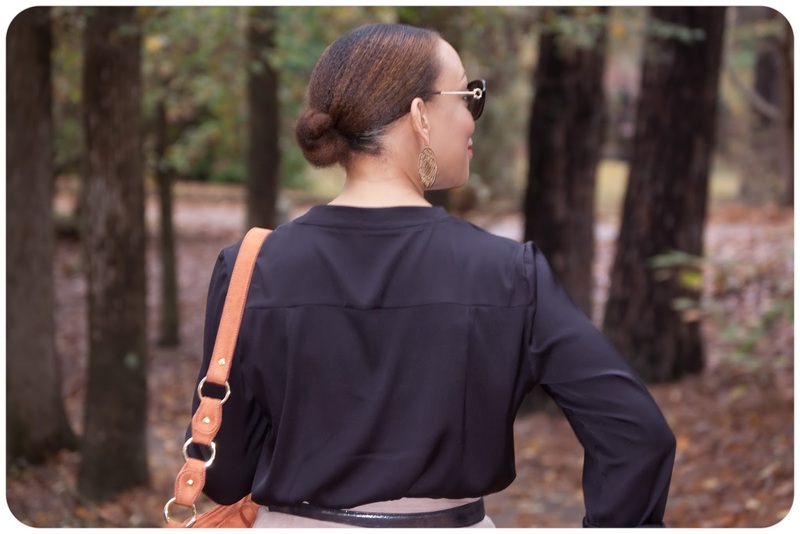 Your height really lets you carry off these styles! You so killed it doll I love this look and its perfect for me to go to work in -- not to dressy and not too casual! love it! Great look! I love seeing the old pattern envelopes too, takes me back to my teen years. This is great, I'm sorry for my terrible prejudices but I'm surprised that something straight from the seventies looks so elegant! Love it! Very vintage YSL! I've been wanting to try making an eyelet top. I love yours! I love the whole wardrobe, especially the eyelet top. I also love how you bold the pattern and the notions to go with it and where you purchased the notions. That is a plus. Super chic as always, you hit the nail on the head for the 70's. Now if had had a Fro I would yell " Power to the people!" Nice job Erica. Absolutely beautiful! So very stylish!